I love my friend Roberto, my Italian brother. We get together several times a year to share our two common interests – music and food. 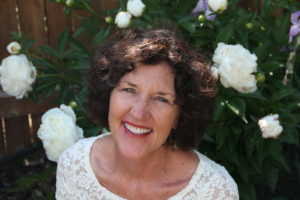 A Graham Nash song causes us to stop everything we’re doing and break out in a sing-along. How does a born and bred Italian, actually, Sicilian, know so much about America’s 70’s rock icons? Well, he is also something of a musical icon himself with regards to Italian and World music. Following American music as a teenager inspired him to travel the world, learn to play guitar and deeply respect music’s evolution. As an expert in ethnomusicology, he teaches his art as well as makes his own instruments. I think his musical brain has also gifted him with exceptional culinary talents. My music-infused kitchen, along with a bottle of Prosecco, provided inspiration for a few tasty new creations. A flank steak was bathing in mustard, tarragon, olive oil, shallots and white wine and we wanted the side dishes to be extraordinary. My culinary genius has been sleeping lately so this afternoon of fun and friendship was just what I needed to wake up the creative juices. Roberto is a fine spontaneous chef. I love how he smells everything and carefully considers how one ingredient will influence the next. 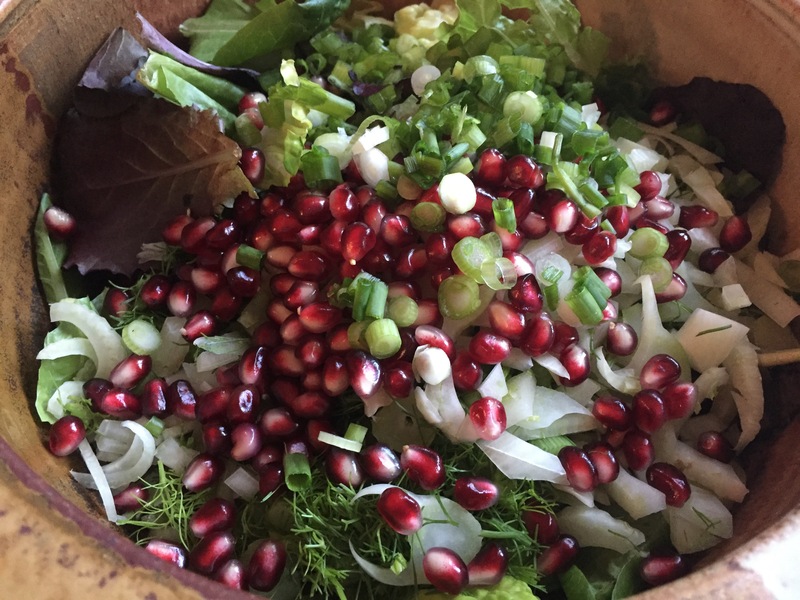 We took our time smelling and tasting several varieties of balsamic vinegar and olive oil before deciding which combination, for a vinaigrette, would add sweetness to the tangy pomegranate seeds in the salad of lettuce, fennel, and green onion. 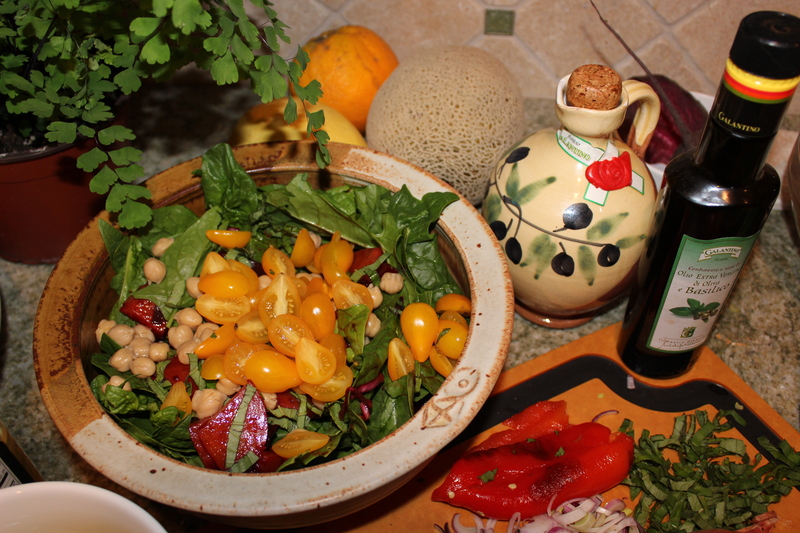 A Sicilian lemon balsamic vinegar, mandarin olive oil, and lots of chopped mint proved a winner. 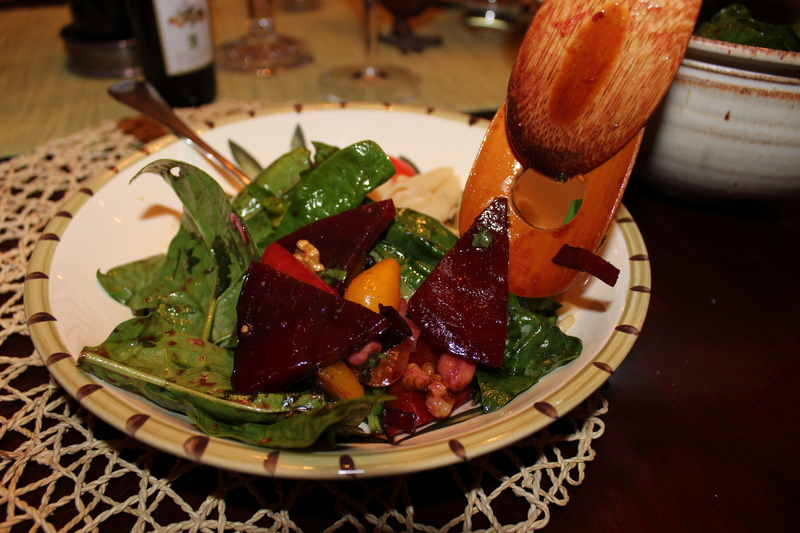 The colorful salad was nothing short of spectacular, with every ingredient in perfect harmony. Patate e Broccoletti (Potato and Broccolini) turned out to be the perfect accompaniment to the grilled steak. Instead of just a side dish of boiled potatoes, and cooked broccolini, we combined the two. This is Italian! 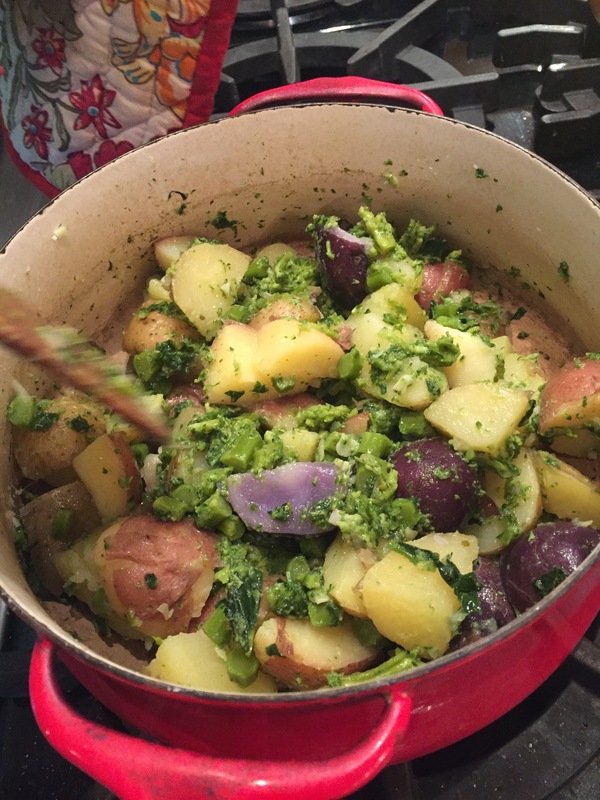 We cut red, purple and yellow boiled potatoes into two-inch chunks and boiled the chopped broccolini. Roberto sautéed garlic in olive oil, added balsamic vinegar, a dash of red pepper flakes, salt and pepper, then tossed in the cooked broccolini and potatoes. Fantastico! Again, terrific flavors and ingredients combined in a unique way to make its own song. 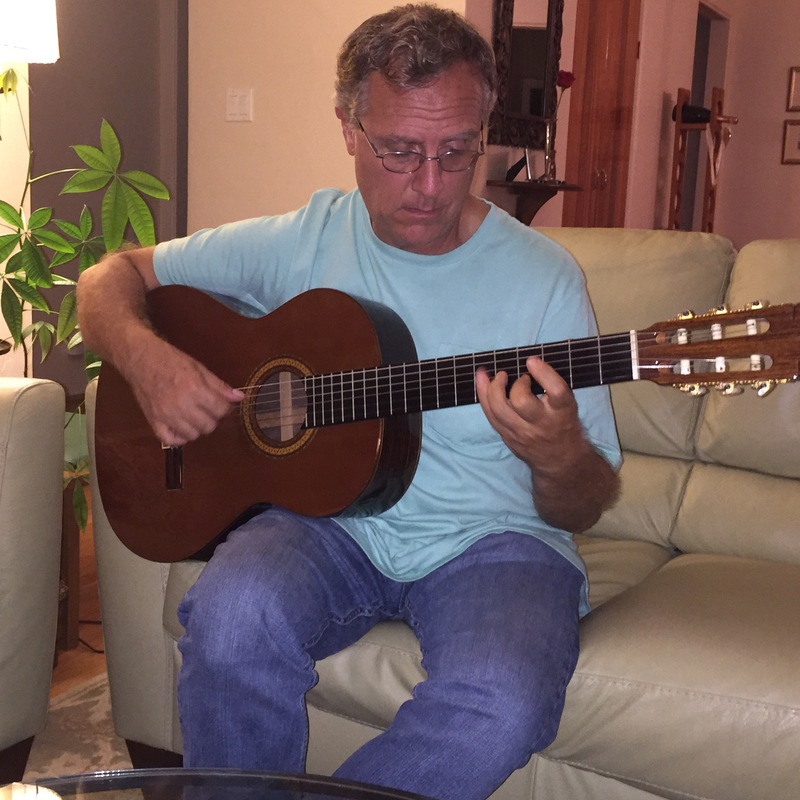 After enjoying the fruits of our labor at dinner, Roberto took out his guitar and we sang “Helplessly Hoping,” by Crosby, Stills and Nash, me in my totally off-key voice, but loving every minute. A mini concert of Spanish infused guitar capped off the evening. It was the perfect day and night. Roberto, you continue to teach me how to achieve depth of flavor, something I always strive to do. Thank you for sharing your songs and your happy energy. When can we repeat??? Combine all salad ingredients. Prepare the dressing. Do not toss until just ready to eat. Sometimes you just need to get out of the norm. 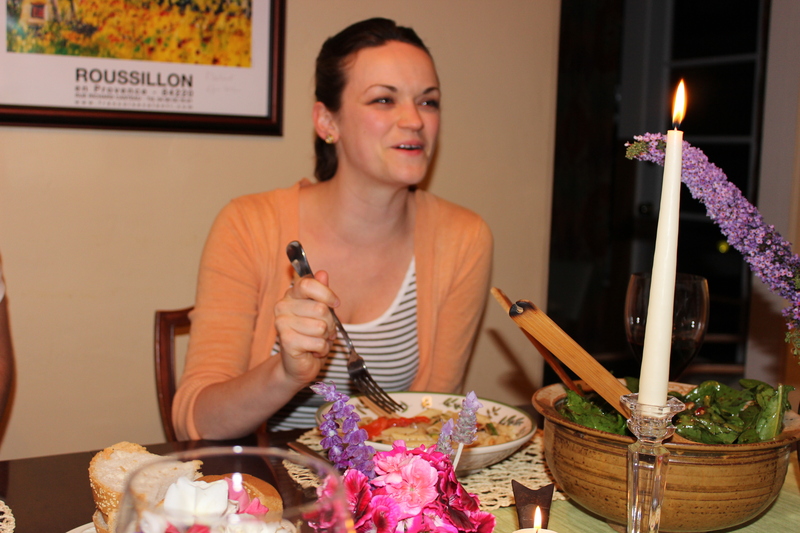 Last night I planned a dinner party but did not plan the menu, hence a spontaneous dinner! I prefer to cook “with” friends rather than “for” friends. 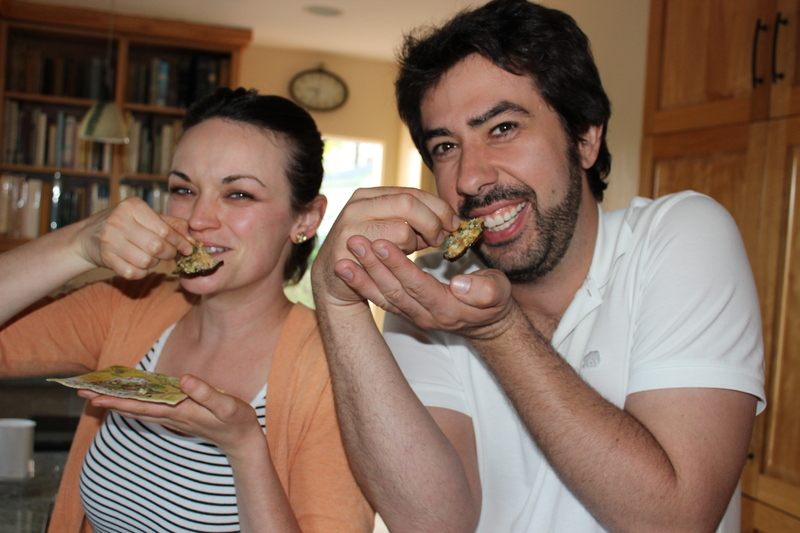 Cooking together is such a personal experience. You get to spend quality time with people you like and share great food and wine. 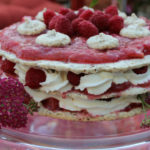 Food definitely speaks to people’s souls and activates openness in communication at a deeper level than any way I know. When my young friends, Meghan and Nick asked me if I would show them a few ways to expand their vegetarian repertoire, I eagerly agreed. 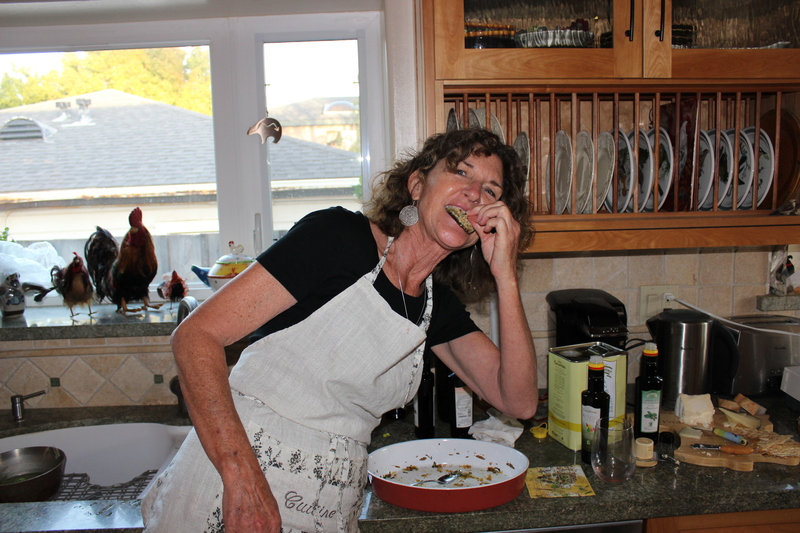 Assisting me with this event was Eva, a fabulous cook and bread baker, with a brilliant mind for improvising. Instead of just sharing my favorite recipes, I thought it would be fun to do a spontaneity themed dinner. By this I mean, have lots of great ingredients on hand, a few ideas to get started, then let the creativity flow. And flow it did into an explosion of flavors and colors. Farm fresh ingredients, a zingy dressing and a mouthful of flavor. 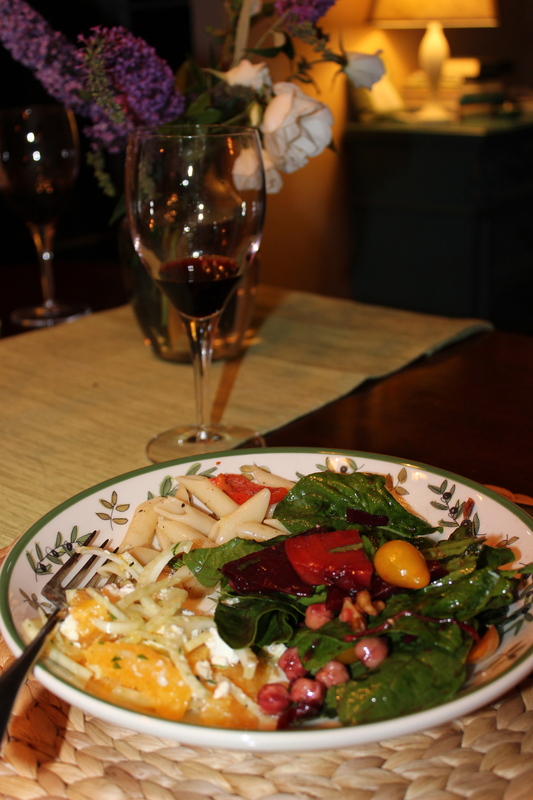 Here’s what we started with and how it played out for a delicious spring dinner. Our ingredients: Fennel, spinach, zucchini, red peppers, red onions, yellow onions, garlic, shallots, fresh basil, beets, yellow pear tomatoes, shiitake mushrooms, parsley, oranges, feta cheese, walnuts, pine nuts, garbanzo beans, Dijon mustard, breadcrumbs and LOTS of great olive oil. 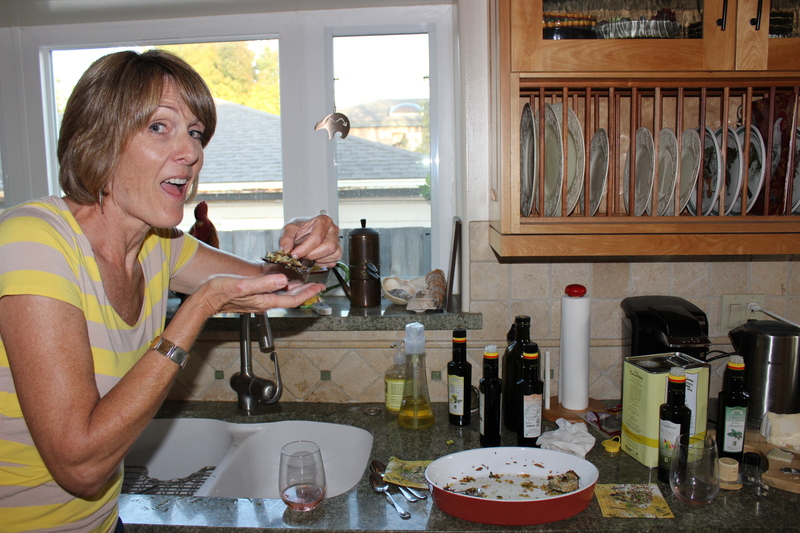 For starters I share a shiitake mushroom appetizer my Italian friend taught me. We ate them so fast that I almost forgot to take a photo! Delectable, easy appetizer. They go quickly so make lots! Drizzle the bottom of a baking dish with olive oil. Place about 12 medium shiitake mushrooms (for four people) on the dish, stems straight up. 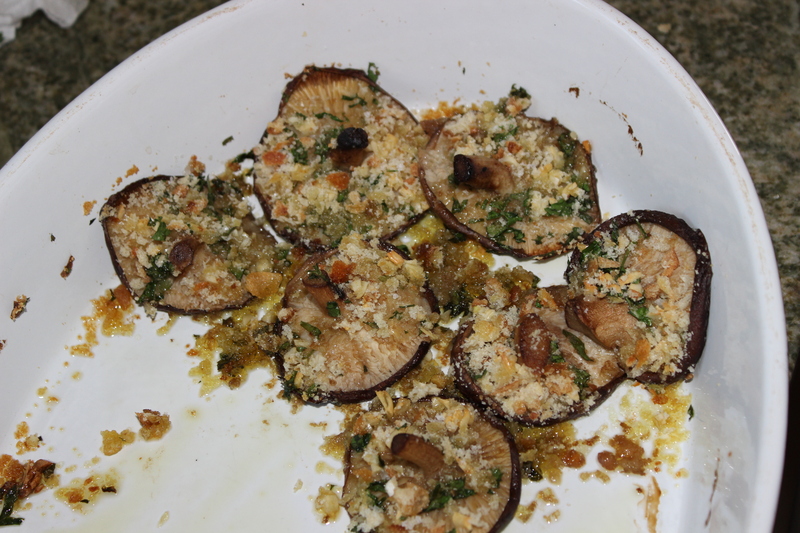 Drizzle more olive oil on top, sprinkle with a generous amount of finely chopped garlic and parsley, sprinkle with salt and top with breadcrumbs. A final drizzle of oil on top, then pop into a 400-degree oven for 15-20 minutes. Eat hot right out of the oven when preparing the other courses. These mushrooms seriously elicit the happiness factor in us all! The rest of the dinner unfolded like we were following a recipe, but we weren’t. Fresh fennel, sliced thin, combined with orange slices, sliced red onion, chopped parsley, and Eva’s vinaigrette made with mandarin orange olive oil and the juice of the orange. This was the favorite, next to the shiitake! 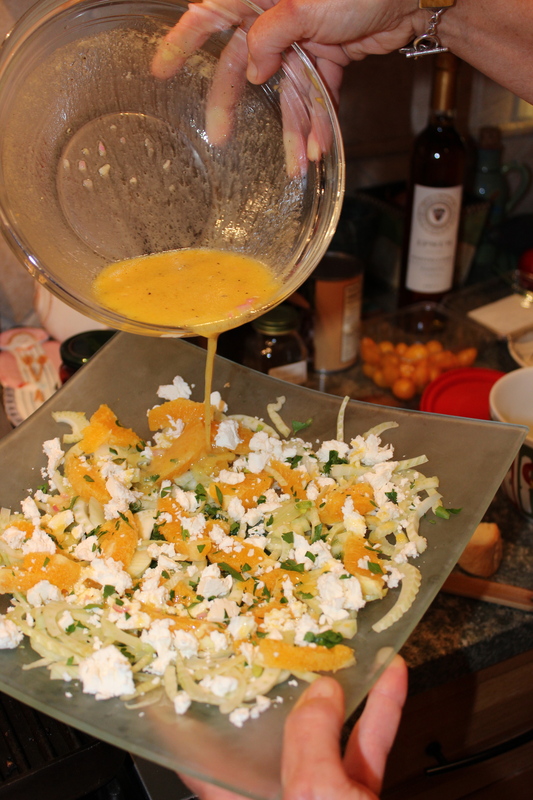 The fennel salad gets a final drizzle of orange vinaigrette. My beet harvest consisted of one giant beet. Yes, I planted about 20 seedlings I grew from seeds, but only one survived. 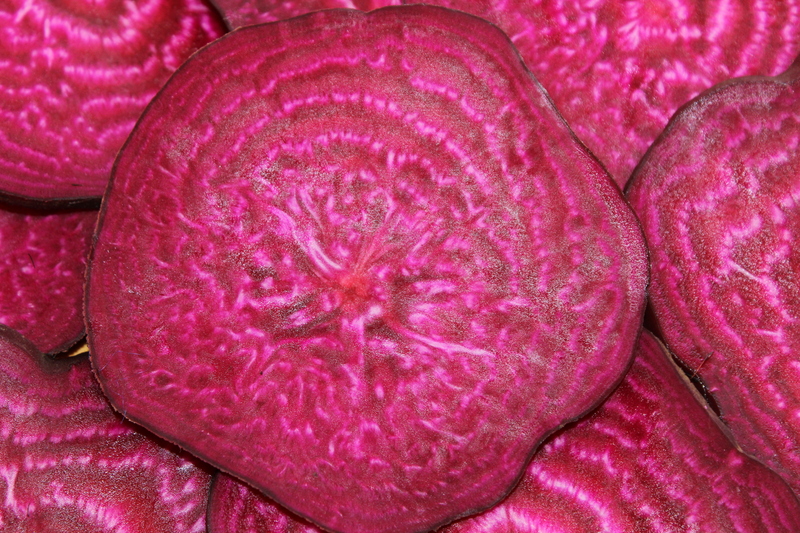 The ruby lines of my beet sing of nature’s simplicity. I ended up with the biggest beet ever and sliced it thinly into rings, then roasted them. Next I cut the beet slices into triangles and made a “pickle” of white balsamic vinegar, cider vinegar, bay leaf, peppercorns and a dash of olive oil. This would be the heart of a spinach salad. Our array of ingredients for the spinach and beet salad. To beef up the salad we added garbanzo beans, walnuts and halved yellow pear tomatoes. The dressing came from the pickling marinade. Colorful, healthy and infused with flavor. For a main entrée, we decided on a roasted veggie pasta. The propane on my grill breathed its final breath so I ended up grilling the veggies on the stove. We grilled onions, red peppers and zucchini and tossed them with penne pasta, chunks of pecorino cheese, fresh basil and a generous amount of basil olive oil. Most of us also dressed our personal bowls of pasta with a generous splash of garlic olive oil. Delicioso! 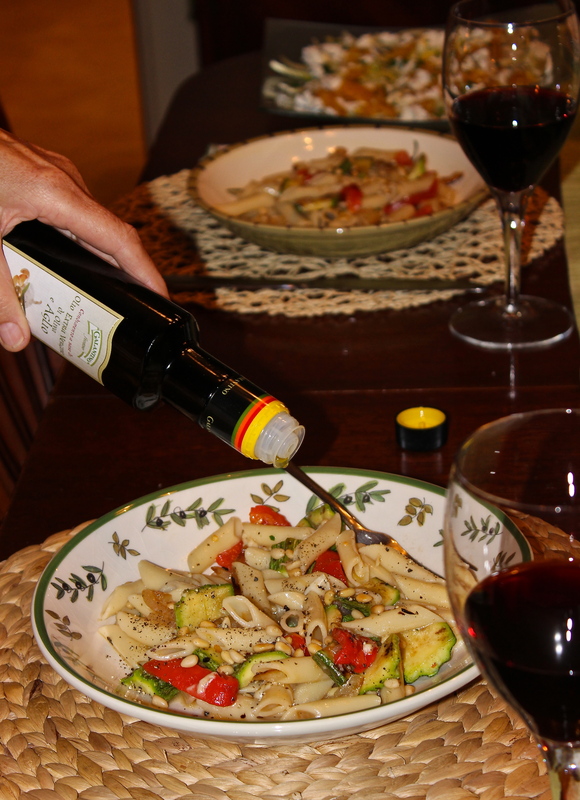 In my opinion, you can never add too much olive oil! Sharing good food, friendships and laughter is always good for the soul. 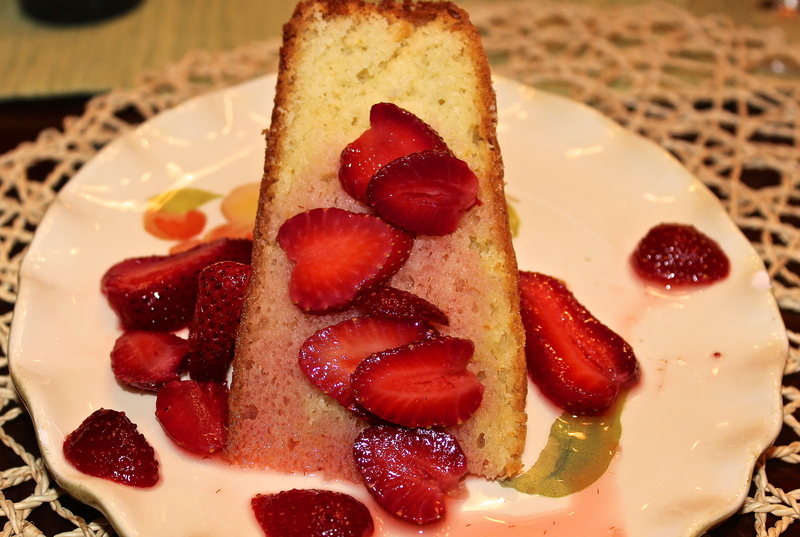 For dessert, I had prepared my favorite go-to lemon olive oil cake with fresh strawberries drenched in limoncello. A moist cake with an almost herbal flavor from the fruity olive oil. Such a whirlwind of activity, chatter and light-hearted fun. I really enjoy cooking this way and recommend it to anyone who wants to have a relaxing cooking experience, expand their mind and their culinary collection. By the way, the olive oil I use, and love, is Galantino from the southern heel of Puglia in Italy. I will soon be importing these fine oils and have them for sale on my website.